Age 97, of Pittsburgh, peacefully embarked on her next adventure on November 15, 2018. Althea is survived by her loving Children; Thomas (Elizabeth) Denk and Roxanne (Jeff) Neubert. Grandma of Heidi (Paul) Tomasko, Kellie (D.J. Petrelli) Denk, Ashley (Joe) Hildreth, and Jonathan Denk; Great-Grandma of seven. Sister of Donald (Barbara) Lape. She was preceded in death by her Husband, Norman J. Denk; Son, Norman D. Denk; Parents, Levi and Margaret Lape; Siblings, Leone Hoelke, Robert Lape and James Lape. Visitation will be held on Monday, November 19, 2018 from 10 am to 1 pm at the JEFFERSON MEMORIAL FUNERAL HOME, INC., 301 Curry Hollow Rd., Pleasant Hills, 15236. A Blessing Service will follow at 1 pm in the funeral home's chapel. Memorial contributions may be made to The Baptist Home Society at www.baptisthomessociety.org . Condolences may be left at www.jeffersonmemorial.biz. 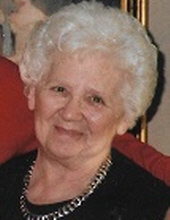 To send flowers or a remembrance gift to the family of Althea R. Denk, please visit our Tribute Store. "Email Address" would like to share the life celebration of Althea R. Denk. Click on the "link" to go to share a favorite memory or leave a condolence message for the family.